Half through last year I began a series here on Reading with Jade titled 'Reading with my Son', and it seems to have gone down quite well, which is great as I had every intention of continuing on with the series and documenting one of my favourite pastimes with my son. My plans for this series in 2018 are a little different however, as I'm going to be sharing a book haul each month showcasing the book(s) Alexander has picked out on our once a month bookshop trip. I may throw in a week of reading here & there, but consistently each month there should be one of these posts - they have been a bit haphazard in the past! We ventured to the bookshop early on in January, and so both of these titles have already been enjoyed... On more than one occasion! 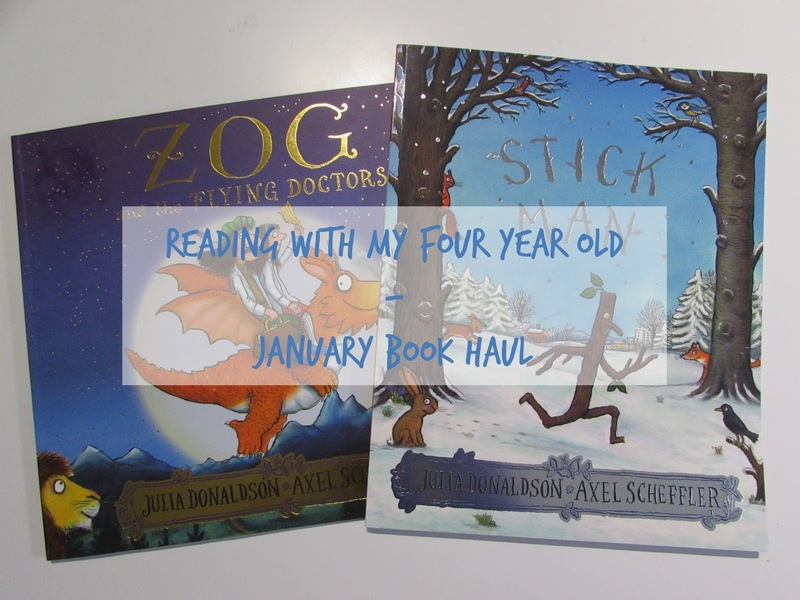 Prior to buying, Alexander was already familiar with both of these Julia Donaldson books as we had borrowed Zog and the Flying Doctors from the library before (he already owns the original Zog book) and Stick Man they have read at nursery. They look like cute books. I’m glad Alexander liked them. Have I mentioned that one that many times?! LOL Yes, I probably have :) Gotta love some Julia Donaldson -- great haul -- I love your idea for this post going forward! Julia Donaldson is a children's bookshelf classic for sure, and I'm always happy to have children's books recommended! I've seen the movie version about, but not watched ourselves yet. I will have to check these out for my own 4 year old! If you do, I hope you enjoy! I bet my niece would love Stick Man. She loves any book where an inanimate object has a fact and a personality!